At School Meeting on Jan. 31, Head of School Margarita Curtis announced to faculty and students that she had decided to retire from her position at the end of the 2018-2019 school year. The question that now faces the Deerfield community is how someone of such impact will be properly replaced. Over the next several months, a search committee will work with search firm Carney Sandoe and Associates to select Dr. Curtis’s successor. This Search Committee is chaired by the incoming President of the Board of Trustees, Brian Simmons, and includes seven trustees, Director of Communications Jessica Day, and two selected faculty representatives, Theater Director Catriona Hynds and History Teacher Joe Lyons. Dr. Curtis addresses the Class of 2017 during Commencement. “Ultimately, the Search Committee will evaluate candidates and recommend one to the full Board of Trustees, which will appoint the next Head of School. There is no set timeline, but the Board may announce a new Head of School as early as this coming winter, if not before,” they stated. The Carney and Associates survey was sent out on Mar. 27 and included questions regarding what respondents value about Deerfield and what qualities they would like to see in a new Head of School. Opinions vary across campus. 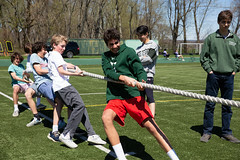 Sami Dulam ’21 said, “I would hope that the new Head of School will be understanding and realize that these are the modern times … Yes, there are rules, but [he or she] needs to look at each issue as an individual story and care more about the students than the rules themselves. 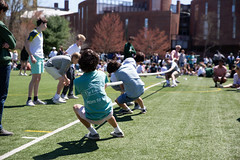 The new Head of School will have plenty of these issues to dive into once he or she arrives arrive on campus, including discussions surrounding dress code and campus inclusion. 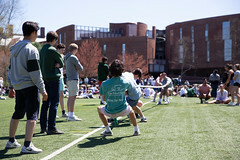 “As a senior, something I have valued most about my experience is Deerfield’s strong tradition. 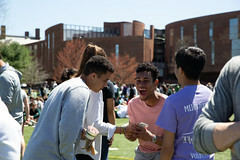 I would like to hope that the school stays true to this, and the new Head of School would face dress code or anything thing for that matter with a stronger emphasis on the Deerfield values that have been in place for decades,” said Alli Norris ’18. Much will be happening over the next year as Dr. Curtis closes her time at Deerfield, but through all of thism the Search Committee will do all in its power to find someone “worthy” of replacing her.